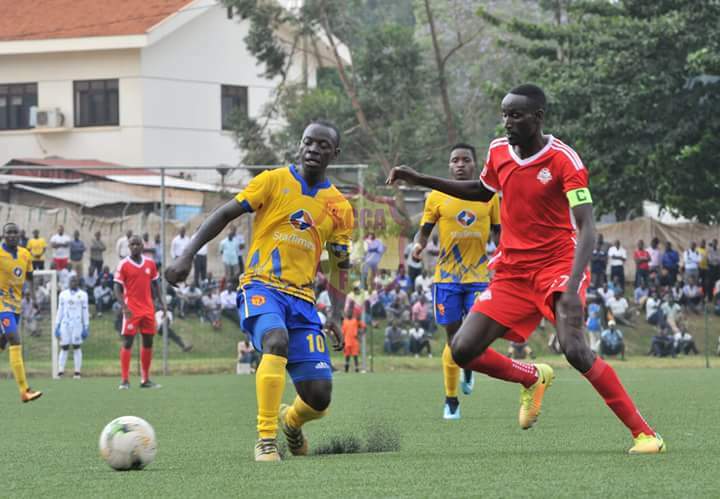 KAMPALA – KCCA FC endured a frustrating afternoon, drawing 0-0 with Kirinya JSS at the StarTimes Stadium in Lugogo on Tuesday afternoon. Coach Mike Mutebi made a couple changes from the team that started last week’s 2-1 win over Tooro with Muwadda Mawejje and Ibrahim Sadam Juma starting ahead of the injured Julius Poloto and Herbert Achai. The visitors started brightly and should have taken the lead after just four minutes only to be denied by Charles Lukwago after a poor clearance by Timothy Awany. The Kasasiro Boys responded with attacks through Patrick Kaddu and Allan Okello but could not find the break through either. At the start of the second half, Ibrahim Sadam Juma was hauled off for Allan Kyambadde to give the champions another dimension in attack but Charles Ayiekoh’s charges stood resilient till the final whistle. KCCA remain unbeaten in the new season, having won one and drawn the other of their first two games. For Kirinya, this was their first ever point off KCCA on their fifth time of asking. The Jinja-based side has now drawn both of their first two games of the season, having played out a two all thriller with SC Villa last Friday. Elsewhere, Allan Kayiwa’s second-half strike was enough to hand Tooro FC their first victory of the season. The Fort Portal based side who lost 2-1 away to KCCA FC finally registered their first three points with a hard fought 1-0 win in Njeru over Bul FC. Godfrey Lwesibawa nearly put Tooro United in the lead in the 13th only for his effort to go a few inches wide. This was a wake-up call to the hosts who responded by Richard Wandyaka’s strike which was well dealt with by Joel Mutakubwa. BUL FC was forced into an early forced substitution when Joshua Lubwama come on for injured Patrick Sembuya in the 40th minute. Minutes after the restart, Kayiwa but the away side in the lead. This was the former Express FC midfielder’s second goal of the season after scoring the consolation against KCCA on Friday. Simon Sserunkuma and Lwesibawa created several opportunities later but could not double Tooro’s advantage as Hannington Ssebwalunyo stood tall to save his side. Villa Oromchan thought he had leveled matters for BUL but his effort was ruled out for offside by referee Joseph Ochom. The results leaves BUL FC 6th while Tooro United move up to 7th from 10th. Both teams will be back in action on 16th- October as BUL will be paying a visit to Paidha Black Angels Arua and Tooro United will play host to Kirinya Jinja SS at Buhinga Stadium Fortportal. At Luzira, Vipers rallied from a goal down to defeat Maroons 2-1 in Luzira and move top of the league table. All the goals came in the first half as Pius Obuya put the hosts ahead with a sublime strike before Davis Kasirye leveled matters with his second in as many games. With half time beckoning, Moses Waiswa curled home a sublime free-kick to ensure the venoms maintain a 100% record in the new season.